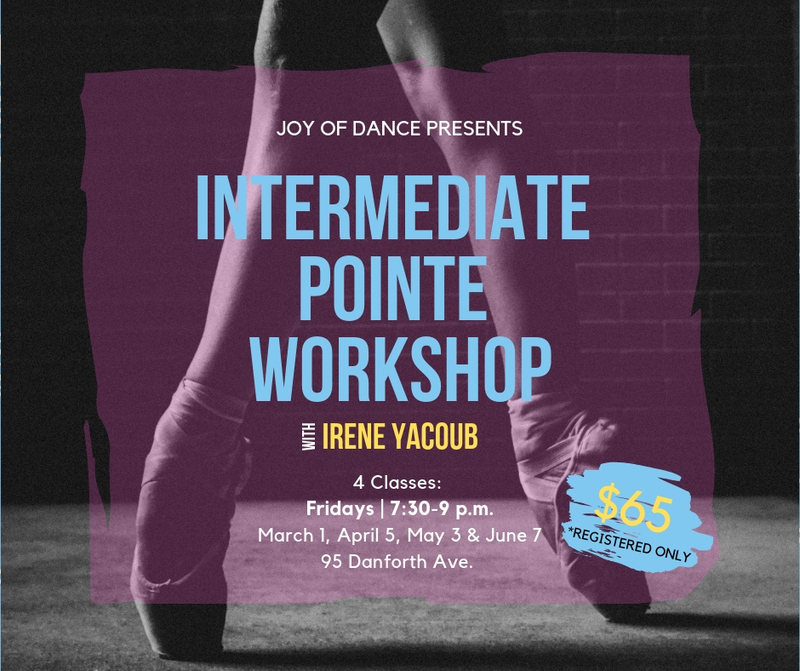 Beginning March 1st, Joy of Dance will be offering a monthly Intermediate Pointe Workshop, for only $65 for 4 sessions. Taught by Irene Yacoub this workshop is intended to build dancers’ technique and ease on pointe. A full ballet class with be taught, all to be danced in pointe shoes, the barre, centre and allegro. Designed for dancers with 3+ years pointe experience, the course will be split into 4 sessions (Mar 1, Apr 5, May 3, Jun 7), on Fridays 7:30 – 9 P.M. Registration for this workshop is required in advance and needs to be done over the phone or in person. Dancers can miss one session, with 24 hrs notice, can apply the credit to one of our JOD jump-in classes.